And Anatolia! Embrace us with your fruitful soil. Let us be baptized in your cool healing streams. Let us be purified in Tigris and Euphrates, the vital sources of Mesopotamia. Let us watch a Sema ritual in Konya and feel the peaceful spirit of Mevlana and his whirling Dervishes. Let us seclude ourselves and live in peace until we pass away in this holy ground. Saint John knew Mary would live her final days in stillness in Ephesus. And so he took her there. And so she did live in stillness. Listen to the whispers of those who survived, endured, pioneered and cherished times of many civilizations. You’d feel like you’re in a fairytale in which many celebrities play their leading roles: Clear the road! Suleyman the Magnificent has returned to Istanbul on his horse. Obviously he has had another triumph and wants to rest at Topkapi Palace. No doubt, first thing, he’ll visit the Harem to see his beloved Roxelane. Come Sinan the Great! Chief Architect, who turned Istanbul into a city of art and architecture for over fifty years. Build Süleymaniye Mosque now. Add it as another jewel to the Golden Horn along with Hagia Sofia. Dear Bosphorous; no need to be jealous. History granted you Dolmabahçe, Blue Mosque, Rumeli Fortress and a dazzling view. You are always a feast to the eyes. Oh mighty Marc Anthony! Your majesty had no other chance but fall in love with that beautiful queen of Egypt, in Antioch, south-eastern Turkey. Ladies and Gentlemen, as you enter the church of Saint Nicholas in Demre, please salute Santa Claus who was a bishop in southern Turkey and really did give presents to poor people then. 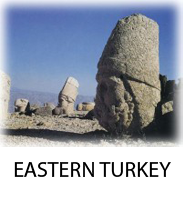 As we move along, seize the astonishing sun rise on mount Nemrut where King Antiochos sealed his marriage to the beautiful Persian lady with those giant magnificent statues. Did the Ionian king Androklos know if his name would be of history when he walked the famous marble road at Ephesus? Don’t miss out the early Christians who brilliantly built those underground cities and escaped the Arabs in Cappadocia. They also carved churches out of volcanic rocks there.